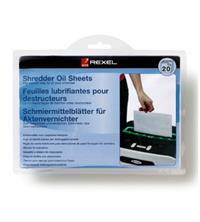 These Rexel Shredder Oil Sheets (20 Pack) are an incredibly easy and convenient way to oil any shredder. Simply feed an oil sheet into your shredder, the same as you would when shredding paper. Do this once a month (or every time you empty the waste bin) to help prolong the life of your shredder and keep it working at its best. These oiling sheets are A5 in size and using them enables you to get the right amount of oil distributed on the cutting blades every time. Also available in a pack of 12.